Jon began his legal career clerking for the Honorable Eldon B. Mahon in Fort Worth from 1984 to 1986. Thereafter, Jon joined Kelly, Hart & Hallman where he was a litigation partner specializing in commercial litigation. In 1993, Jon co-founded Friedman, Suder & Cooke and shortly thereafter added intellectual property litigation to his commercial litigation practice. Since approximately 1998, Jon has primarily focused on representing plaintiffs in intellectual property litigation, but continues to handle commercial litigation matters. For a video that takes a closer look at FSC’s IP-litigation practice, see here. Jon served on the local grievance committee for several years serving as co-chair of the committee. In addition, Jon was an adjunct professor at Texas Wesleyan University School of Law (now Texas A&M University School of Law) teaching a class in trial advocacy to third year students. He is a Life Fellow of the American Bar Foundation and a Member of the American Board of Trial Advocates (“ABOTA”). 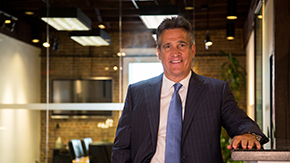 Jon has been accorded the highest Peer Review Rating™ by Martindale-Hubbell®: AV Preeminent®, and has been recognized on multiple occasions as a Super Lawyer by Texas Super Lawyers®, and as a Top Lawyer by Fort Worth, Texas magazine. Jon continues to assist owners and inventors on intellectual property matters, primarily on a contingent fee basis.